This week has been an incredibly busy week for me. I have ran all day from the time I get up in the morning until I go to bed, and have barely been home. We have had trick-or-treating, open house at school, a band concert, church, it's been a crazy week. On Saturday morning we went to the local Boy Scout's Haunted Woods. We took all of the kids, not just Little Man, and they all had a blast. Their favorite part of it all was getting to paint a pumpkin. When we got home Saturday afternoon we finally carved our pumpkins. At church on Sunday there was a celebration for the pastor who was celebrating 10 years at the church. After the worship service, there was a dinner, and entertainment. It was 3:30 before we finally left. On Monday night we went trick or treating. I am thrilled that Thanksgiving is just around the corner. I still haven't taken down my Halloween decorations but it's on my list of stuff to do this week. If you read my blog you know that I love to eat, and when it comes to holidays themed food is right up my alley. 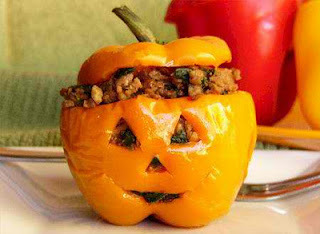 With Halloween being just a few days away I wanted to share with you some of my favorite food ideas and recipes from around blogland. 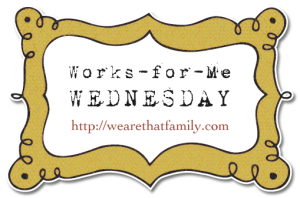 Join us for Works-for-Me Wednesday at We Are That Family. With November right around the corner I wanted to share a family tradition that we started with our kids a few years ago, it's a Thanksgiving Blessing Tree and I first blogged about it back in November of 2009 (you can read that post here). Pinterest has turned into a total addiction for me and I am finding a ton of great new recipes on their site. One of those recipes was the Chocolate Caramel Doughnut Holes from The Way To His Heart. I tried these last Wednesday and I am pretty undecided on how I feel about this recipe. On one hand the doughnut holes were amazingly delicious on the other hand they are a lot of work. The dough for them was really sticky when I followed the instructions, and I ended up having to add alot of flour to make the dough workable. When I tried to roll the holes with the caramel inside they didn't want to hold together very well. The recipe as written did make a HUGE amount of doughnut holes, and they were large. I think for a special occassion this is a great recipe, but for just a nightly snack it's too much. I am linking this post up to Tempt My Tummy Tuesdays at Blessed With Grace. I know it's Tuesday and I am a little late getting my weekend roundup posted but as I said yesterday I am kind of in a funk but today has really gotten me out of it. I think it was a combination of the cold and rainy weather with stress. I am not proud of it but the weather really plays a lot in my moods. Anyhow, it's warmed up and the sun is shining now! The kids were on Fall Break on Thursday and Friday of last week. We had planned on Thursday to drive down to visit my grandmother, mom, brothers, and cousins on Thursday but Bubbles broke her glasses Tuesday night. So we made an appointment for her to see the eye doctor early Thursday morning, which we did before heading out on our two hour drive. We spent the entire day at my grandmother's the kids getting to play with cousins, and their uncles who aren't too much older than them. We played cards, laughed, and joked. It was a great day. We left on Thursday night and didn't get home until late. I've been in a funk the last few days, it's been a functioning funk, one of those where I can get up and do stuff but one where I just feel "off". My kids haven't been in a very good mood, fighting constantly, keeping my nerves up, and I think that has a lot to do with my mood. I also think the weather change has a lot to do with my mood. Anyhow, I hope that I can kick it pretty soon. I haven't really felt in the mood to make out a menu plan but am forcing myself to do it because I know that without it I would be lost. Last night was the Friday Night Sew-In that is hosted by Handmade by Heidi and Crafty Vegas Mom. I participated and accomplished quite a bit. I was able to finish five, yes five, infant crochet hats. Granted the red and black striped munchkin hat was already crocheted it just needed a pom-pom made and put on it but still I must say I did get quite a bit done. Honestly, yesterday was one of those cold, rainy nasty days where curling up on the couch with some yarn and catching up on some DVR'd shows was wonderful. Plus, I must admit this was not really crocheting just for fun, it was for work, although for me all crocheting is fun. Flirty Aprons, my fave apron compnay, is at it again with one of their flash sales. This weekend only they are holding a Flash Sale with 50% off of select aprons. To get this discounthead on over to Flirty Aprons by using this link, and enter the code "flashweekend" at checkout! Want to win $100 worth of credits from Mamasource? Does your little one have an absolutely adorable Halloween costume? If so just head on over to Mamasource, upload a picture of your little on in their Halloween costume, and then start campaigning for votes. The top 10 photos will get $100 worth of Mamasource credits. But hurry because pictures have to be uploaded by October 21st, and voting starts on October 22nd. My husband has been begging me and begging me to make him a pumpkin pie, so I made two for the kids birthday party on Saturday. On Sunday he was begging for another one. Why? He only got two pieces of the ones I made on Saturday. Fine but I was out of sweetened condensed milk, which is what my recipe calls for. 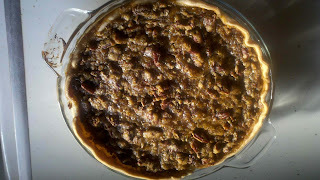 So I set out looking for a pumpkin pie recipe that doesn't require sweetened condensed milk and found thisCaramel Pecan Pumpkin Pie recipe from All Recipes. The pie was very easy to make, although I did make some changes. I had a 29 ounce can of pumpkin instead of a 15 ounce can so I decided to double the rest of the recipe to make two pies instead of just one. I figured one ounce of pumpkin wouldn't hurt. I didn't have lemon zest so I just left it out. Last week was a great week, and I actually got to do some cooking for once which is nice. For me cooking is not just getting a meal on the table, it's the fun of making a recipe or two completely from scratch. Since school has started many of our meals have been what I consider "quick fixes" and not cooking. This week is going to be a little crazy so there won't be too much cooking going on around here. Remember back in August when I talked about the $25 gift certificate you could get for $2 to Inspired Silver through Save More? If not the post ishere. I ordered the gift certificate and used it to buy Bubbles two rings. One for her birthday and one for Christmas. Not bad for $2 is it? It's been another busy weekend around here. As I had mentioned earlier in the week we had Bubbles and Skateboarder's birthday party this weekend. Which meant Friday night was spent doing last minute cleaning, cooking, and decorating. Since I had been gone shopping all day Friday this meant that everything had to get done in just a few hours. It was crazy and I was exhausted when I hit the bed. I was only able to get 4 hours of sleep before I had to get back up on Saturday morning to get everything ready for the party. The party was a blast. 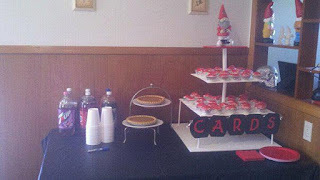 We are big University of Louisville fans around here so we had a party centered around our beloved Cardinals. I was soo tired Saturday night and was able to get some rest after everyone left. Sunday was an equally busy day. We woke up early and went to the flea market. After we left the flea market we drove by a Rehab Center that I have a job interview at tommorow just so that I knew exactly where I had to go. This is a Sponsored post written by me on behalf of Straight Talk for SocialSpark. All opinions are 100% mine. 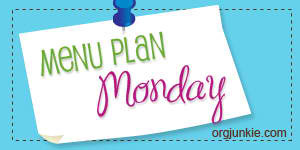 I have always heard that one of the biggest ways to cut down on your monthly bills is to get rid of your monthly contract cell phone and go with a pre-paid plan instead. This is something that I tucked away in my mind but hadn't really acted on. Well, now our cell phones are out of contract and this is something that I am definitely considering. I currently have an Android phone that I love, so I really don't want to give it up so finding a pre-paid cell phone provider that offers Android phones is important to me. The power of Android has a spell over me that I just can't break. I don't think I could ever go back to using a normal cell phone now. Want to know something that sounds silly? I Feel Richer with Android phones. Sort of like this lady. Several months ago I was watching a Pam Cooking Spray commercial (which is suprising since I don't watch many commercials since we got a DVR) and I noticed them spraying Pam into boiling water before they added their spaghetti noodles. I was kind of suprised and wondered why they would do that, I figured it had to be to keep the noodles from sticking to the bottom of the pan, which I tend to have trouble with when I cook macaroni and cheese. So, of course I had to give it a try. The next time I was boiling water for macaroni and cheese I sprayed a little Pam into the water before adding the noodles, and guess what??? The noodles didn't stick! So this has become my go-to trick when cooking noodles, I spray in a little cooking spray before adding noodles. So now my question is did everyone but me already know this? Or are you all as shocked by it as me? I am still looking for a comforter set for Bubble's bedroom, as I have yet to find the one that just knocks my socks off. It is so hard to find the perfect one for a fourteen year old girl, trying to find the one that isn't too grown up looking or doesn't look too babyish. Today I visited Brylane Home and was pleased with the amount of bedspreads and comforters that they have to choose from. I actually found two that I really like. I like this one but I am not sure if she will. It will go well with her current curtains, and the current color scheme of her room.